Today we give thanks to God for the gift of beatification of John Paul II, Great Pope. 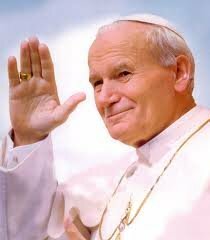 May the testimonial life and legacy of our Pope chalenge us to live by the example of his life and love. May our lives proclaim his teachings. Dziękujemy dziś Bogu za dar beatyfikacji Jana Pawła II. Niech ten wielki dzień stanie się dla nas wezwaniem do podejmowania i wcielania w życie przesłania, jakie zostawił nam swoim życiem i nauczeniem błogosławiony Jan Paweł II. 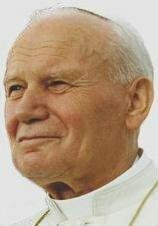 This weekend marks the beginning of the 9 week Novena in thanksgiving for the beatification of John Paul II. Our Novena will be dedicated for the intention of families. John Paul II was concerned much about families. He prayed for families and always had encouraged families to be faithful to God’s plan of salvation. In our Novena we will read John Paul’s words regarding family and then offer a short prayer. The Novena will be prayed after each Sunday Mass. We encourage you to pray it at home, too.